The hotel is in the process of 'upgrading'. The restaurant is still like 'feeding time at the zoo' with no dress code in the evening. Customer behaviour and manners are terrible. It has to be said that the food is very good, however its a restaurant that you want to get out of as quickly as possible. Staff are friendly. The pool is very small for the size of hotel. Bedrooms are being refurbished however new rooms now include a glass toilet door with no lock ! There is very little storage space and no tea/ coffee making facility. 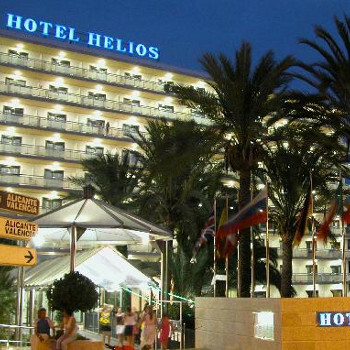 The hotel is very well located, close to the airport and fantastic beach. Lot's of nationalities at this hotel & resort with English very much the minority. A strangely unfriendly resort - maybe it's just unfriendly towards British. Amazing beach and walks / cycle rides into Palma. Hotel tip: High floor with pool or side view - rear of hotel is above a very busy road. Hotel is in a good location 2 minutes from the beach, we were on the 5th floor, room over looking the pool/part sea/road. Not to many Brits at the hotel but that suites us just fine. The rooms could do with a bit of TLC but for the price we paid it was OK.
Television had only CNN on the English channel. Maids came everyday if you left towels on the sink they would get changed if left on rail's they didn't. The food wasn't up to much, we only went for breakfast twice. The restaurant was very busy when we were there, people queuing at the bar for drinks meant that the queue was in the corridor,we just went past the queue and got our table and went for a drink when the queue had gone. All staff work hard, and they were doing there best to clear the tables fast. Bar staff are very nice, we only saw evening entertainment twice when we got back to the hotel from our night out, what we saw was fine. Don't think that we would return to the hotel mainly due to the food. Safe hire 20euro you get 6 back on checkout. Fridge hire 35euro per week. Not to bad for price we paid. We have stayed in this hotel several times both in the hotel rooms and in the apartments. The hotel rooms are very basic and need some updating. The apartments are very good basic accommodation and have a lovely view across the gardens to the pool. Food is very basic and not great in the evening. Entertainment is OK. The bar staff are brilliant. All in all this hotel offers great value and is in a great location approx 50 metres from the fantastic beach. English are in a minority in this hotel , the majority being French, Scandinavian, Spanish and of course German. It has a very nice feel to it though. A great place to stay, 10 minutes from the airport and 50 metres from possibly the best beach in Mallorca. A hotel we have stayed at regularly. This year stayed in one of the apartments on a half board basis. The gardens are very attractive and there is a very happy relaxed feel around the bar and pool area. English in the minority, more german , french and spanish, which is ok. Excellent value hotel, and only 50 yards or so from the fantastic beach. Great value for money,and only 10 minutes by taxi from the airport.